Parbake the pastry crust and set aside to cool. Blend cooked breadfruit in food processor with coconut milk, milk, egg yolks, honey and vanilla. Pour mixture into crust and bake for 25-30 minutes at 345 degrees F.
Cool. 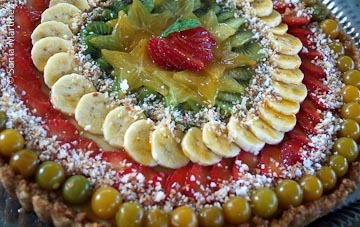 Top the tart with spirals of fresh fruit. Melt guava jelly and brush tart to glaze. Sprinkle with the toasted coconut. NOTES: (*) Fruit used were Waimea strawberries, poha berries, kiwi, mango, starfruit and apple bananas. To parbake is to partially bake a crust or dough and store in freezer for later use. When the core of the 'ulu comes easily out, your 'ulu is ready to use. 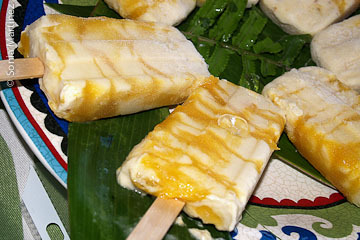 Scoop the creamy insides into a blender and add the coconut milk and sugar cane juice. Blend. If mixture is to your liking, pour into the popsicle molds or ice cube trays. In a squeeze bottle, mix liliko'i extract and add a touch of honey for consistency. Squeeze a couple of squirts into each mold to add a nice look and good accent to the 'ulu. Freeze and enjoy! NOTES: Only use the creamiest part of the ripe 'ulu, not any stringy parts. If you don't tell people who dislike 'ulu what they are eating they very often like it. For ripe 'ulu lovers this is so ono (delicious). You can always use more coconut milk, as they ('ulu and coconut) are such sisters in taste. With an electric mixer, beat ulu, syrup and milk until thoroughly mixed. Add butter, honey and egg yolks and mix until well blended. In a separate bowl, combine flours, pudding mix, baking powder and salt. Mix into wet mixture by hand. In a separate bowl, beat the egg whites until stiff. Fold into the other ingredients with a spatula. Pour into greased Bundt pan and bake at 325 degrees Fahrenheit for about 1 hour 10 minutes until a knife inserted comes out clean. With an electric mixer, beat ulu, syrup and 1/8 c. cream until well blended. Add ginger, if using, and mix well. In a separate bowl, beat the eggs, honey and sugar until foamy and pale in color. Add salt and cardamom, if using. Set aside. Heat 3/4 cup milk and 1/4 cup cream together in a saucepan until simmering. Slowly beat into the egg mixture. Pour ingredients back into the saucepan and cook, stirring constantly over very low heat, until custard begins to thicken. Remove from heat and beat in ulu mixture until well blended. Sieve through a strainer to remove lumps. Stir in 1 cup cream and vanilla. Stir chilled custard. 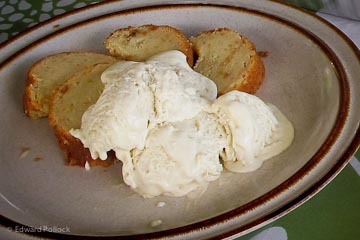 Then freeze with an ice cream maker and store in the freezer until ready to serve. Kiawe (Prosopis palida) is a highly nutritious bean pod for both humans and livestock. Though native to coastal South America, trees are naturalized in Hawaii, and grow prolifically along the Kona coast. Harvest beans while still on the tree and fully yellow. *To make syrup, boil 3 cups of broken bean pods with 6 cups of water for one hour or until about 3 cups of liquid remain. Strain out bean pods (which can be fed to livestock or chickens as a high protein feed). Add 1/4 package of pectin and bring back to a boil. Add 1/2 cup of kiawe honey and 2 Tablespoons lemon juice. Bring back to a boil and cook, stirring constantly, for about 1 minute. Pour into bottle and refrigerate. **Kiawe flour can be made by drying the bean pods in a food dehydrator or oven set to 150 degrees Fahrenheit for 2-4 hours. Pulse in the blender until bean pods grind down but beans remain whole. Sieve flour away from beans. Store in the refrigerator.